European captain Paul McGinley has no concerns over the relationship between Northern Irishmen Rory McIlroy and Graeme McDowell ahead of the Ryder Cup. 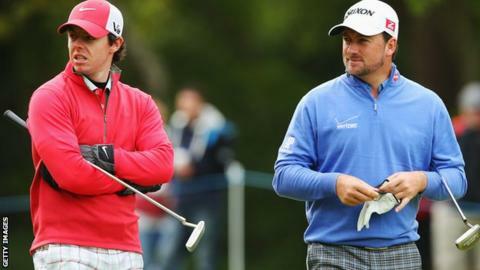 The pair have played together six times in the last two contests but are both involved in a court case with McIlroy's former management company. But McGinley says there are no issues ahead of the event at Gleneagles. "It's not a concern. It has been going for a year and both have had very strong years," he said. "I would be very surprised if they don't play together, although I'm not going to write it in stone." McIlroy's legal battle with Horizon Sports Management also involves the business affairs of McDowell and the judge hearing the case said on Tuesday it features such sensitive matters that the sides should engage in mediation. "The case has all sorts of sensitivities involving two players on tour, a manager of one of them and a former manager or agent of the other. It has all sorts of complex issues involving relationship matters," Mr Justice Brian McGovern told both legal teams. McDowell has been represented by Horizon since 2007 but recently announced he would leave the company by the end of the year. Last year McIlroy, 25, denied a rift with 35-year-old McDowell shortly before he announced his departure from Horizon and claimed the pair "remain great friends". McGinley believes the matter has not affected the form of either player, and has been promised the issue will not impact upon their preparations for the Ryder Cup, which begins on 26 September. He added: "Rory's had arguably his best year ever and Graeme won the French Open. It has not affected their performance and both of them have assured me it's not going to affect anything in the team room."